1. IKEA's Mongstad mirror comes in three different colors (black, white and orange) and is a bargain at just $99. It can be hung vertically or horizontally and would look great above a sofa as shown. 2. 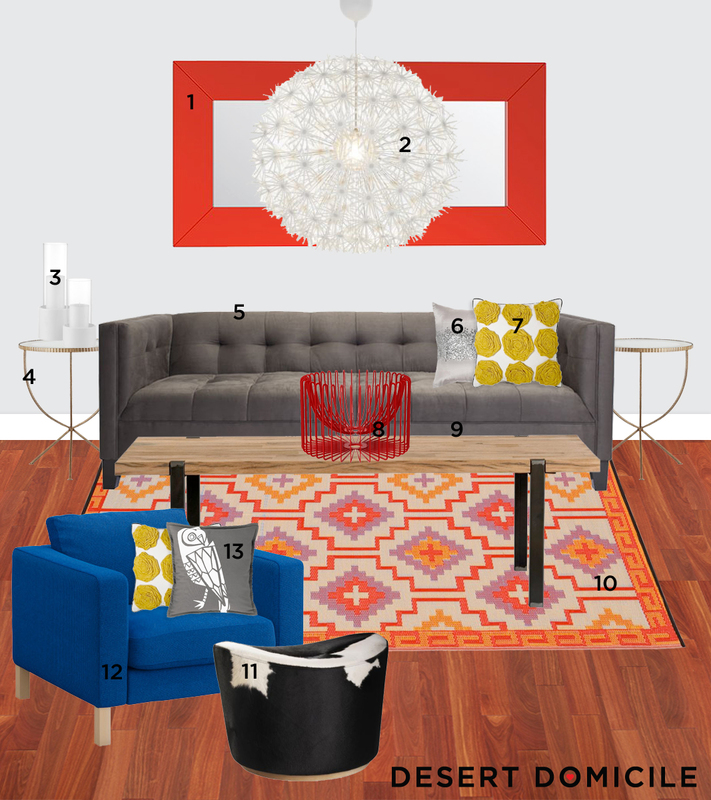 I recently hung IKEA's PS Maskros pendant lamp in my living room and absolutely love it so I wanted to incorporate it into this mood board because I think everyone with high enough ceilings should have one! 3. The ceramic lanterns from CB2 can be used indoors and out and would add a beautiful, soft glow to the room when the PS Maskros lamp is turned off. 4. A pair of Crate and Barrel's large Jules accent tables give this living room a little burst of character with their unusual details, including a one-of-a-kind antiqued mirrored top. 5. Z Gallerie's Benny sofa is modern, streamlined and tailored. It's upholstered in charcoal velvet microfiber and is accented with a variety of throw pillows. 6. The first throw pillow is the flash pillow from Chiasso and gives this living room some sparkle and elegance! 7. Paired with the flash pillow is Dwell Studio's yellow rosettes pillow from Target. I like that this pillow is double sided (two pillows for the price of one!) and also like how the rosettes mimic the dandelion-esque poofs of the PS Maskros lamp. 8. The tradig bowl from IKEA is the perfect coffee table accessory since it can be used to corral all of your remotes or hold a variety of decorative objects! 9. If I was in the market for a new coffee table, the Bengal coffee table from CB2 would be at the top of my list! The top is made of reclaimed Indian railroad ties which is supported by industrial tube legs and makes for a very modern and substantial piece of furniture. 10. The casbah rug (also from CB2) can be used indoors and out and is made of recycled polypropylene. I love the geometric Moroccan pattern and the fact that it's only $79.95! 12. The Korndal medium blue Karlstand armchair (also from IKEA). I love the lines of this armchair but I'm not a fan of the natural colored legs and would probably end up staining them black to match the legs of the sofa and coffee table. 13. Last but not least is the gray hoot pillow from Chiasso. I love the graphic element of the screen printed owl and chose the gray version to help tie the color of the sofa into the other elements of the room. PS: Check back on Wednesday for a VERY exciting announcement!!! I am in shock the rug is only $80!!! I love anything gray these days so that couch is calling my name. You've put together another pretty board. Girl! This is a yummy room!!! I am so excited about that rug and even more so about your announcement!!! Woot!